Vollrath 72040 Cayenne Twin Well Countertop Rethermalizer / Warmer Package with Insets and Covers 4 Qt. TigerChef > Restaurant Equipment > Food Warming and Holding Equipment > Commercial Food Warmers >< Countertop Food Warmers > Vollrath 72040 Cayenne Twin Well Countertop Rethermalizer / Warmer Package with Insets and Covers 4 Qt. $243.65 Vollrath 72425 Round Soup Warmer 4 Qt. 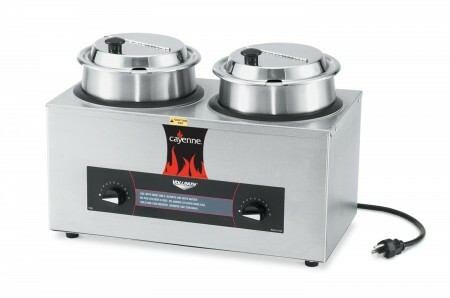 $330.82 Vollrath 72430 Cayenne Warmer Package with Inset and Hinged Cover 4-1/8 Qt. $373.34 Vollrath 72050 Cayenne "Heat n&apos; Serve" 4/3 Size Countertop Food Rethermalizer 28-3/4" x 13-3/4"
$420.09 Vollrath 72045 Cayenne Twin Countertop Warmer 4 Qt. $475.86 Vollrath 72051 Cayenne 4/3 Size "Heat n&apos; Serve" Countertop Food Rethermalizer 28-3/4" x 13-3/4"
Hold and display soups, sauces, stews while keeping them at the optimum serving temperature with the Vollrath 72040 Cayenne Twin Well Countertop Rethermalizer / Warmer Package with Insets and Covers 4 Qt. Perfect for restaurants, school cafeterias, and other food service facilities, this product boasts two exceptionally sturdy aluminum coated wells, each with individual controls for precise temperature adjustments, so you can store two different kinds of foods at the same time. The exterior of this item is made from stainless steel for rust resistance and easy cleanup. Functional and reliable, this countertop rethermalizer set is easy to set up and use and will sit securely on any flat, even surface. This package includes two four 1/8 Qt. insets and two hinged covers to protect the food from airborne contaminants. Holds two inset 4.125 Qt. Dimensions: 17-1/4" x 9-1/4" x 112-1/4"